If road tripping isn't your thing, we have options for arriving by sky. There are small airports in Garberville and Shelter Cove, and a bit north of us, Arcata has daily nonstop flights from San Francisco and Los Angeles. Find out more here. The magnificent King Range National Conservation Area includes and surrounds the Cove. The King Range encompasses over 68,000 acres of public land that offers a diverse mix of recreation and wilderness opportunity including the Lost Coast Trail (part of the California Coastal Trail). Visitors to the King Range can hike to the summit of King Peak and look out over the ocean at 4,088 feet and ride their mountain bikes on the Paradise Royale and Pacific Rim Trails. Developed campgrounds for tent and trailer camping (less than 24 feet), interpretive trails and wildlife viewing areas complement the visitor's experience in the King Range. So many opportunities to explore the outdoors! The Southern Humboldt coast is reknowned for its fishing opportunities. C'mon Sport Fishing is a Northern California Sport Fishing business, based out of Shelter Cove. Trips offer a unique experience of Humboldt County's Lost Coast Fishing. Find out more here. Lost Coast Trail-North 24.6 miles, mostly level The Lost Coast Trail offers one of the few coastal wilderness hiking experiences in the United States. Hikers can view sea lions, tidepools and spectacular spring wildflowers. Solitude can be difficult to find on holiday weekends, so try to plan your hike during weekdays, or the less crowded spring/fall months. Allow at least three days for the entire hike. Find out more here. The Paradise Royale trail system is an amazing way to experience the Lost Coast of Northern California. The trails have been designed and built for a mountain bike optimized experience. The Bureau of Land Management has been partnering with mountain biking advocates and clubs, to plan, develop, and construct an environmentally sustainable, challenging mountain bike trail system in the Paradise Ridge area of the King Range National Conservation Area. The system currently includes 23 miles of trails with varying levels of difficulty. Highlights include; diverse scenic vistas, backcountry settings, and developed bike park features. Visitors will marvel at the backcountry riding experiences that have been skillfully melded with modernized trail construction techniques, resulting in a truly unique ride experience. Find out more here. Nestled in the valley of the Eel River between Redwoods and the Lost Coast of northern California is the Southern Humboldt Community Park. Located just outside Garberville, California the unique natural beauty of this 430-acre park with grasslands, upland forests, prime farmland and native redwoods inspires deep appreciation and reverence for nature. The Park features 3.5 miles of multi-use trails for strolling, hiking, nature-viewing, bird-watching, bicycling, and horse-back riding. With the “Wild and Scenic” South Fork of the Eel River flowing through its boundaries, the Community Park also offers access to much needed recreational opportunities including swimming, canoeing, disc golf, a meditation labyrinth along with a riverside playground and picnic area. Find out more here. If you don't want to do the driving check out the Redwood Transit line, operating shuttles seven days a week! Since 1987, Sanctuary Forest has met the challenges involved in protecting and conserving over 10,000 acres of forests and streams. Sanctuary Forest is a community-based land trust, actively working with landowners to protect, conserve, and restore land in the Mattole River watershed. Sanctuary Forest holds conservation easements on private lands and also offers many programs and services to assist landowners and our community in stewarding and protecting our natural resources for future generations. Find out more about the Sanctuary Forest project, and public hikes here. Let us take you off the beaten path and into the heart of our world-renowned destination. We'll handle the logistics, plan for the tides and show you the ropes. Learn more about our tour packages here. The entire course overlooks the Pacific Ocean and is only a short stroll away from the Inn of the Lost Coast. It’s an easy walking course and the views are spectacular. This is a nine hole links course covering 2,380 yards with a par of 33 for the men and 34 for the ladies. There is one par-5, four par-4s, and four par-3s. The slope rating is 110. 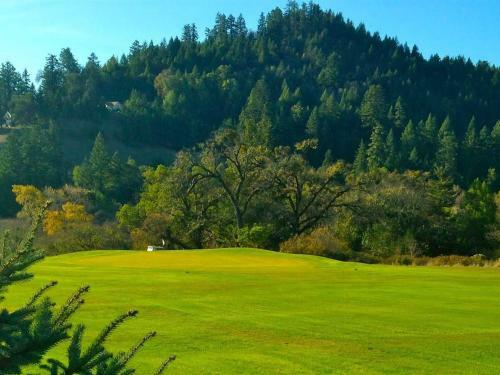 The Benbow KOA offers guests at the historic Benbow Inn a 9-hole golf course experience. Enjoy a day out on the green, then come by the lounge for a refreshing beverage! The seven principles of the “Leave no Trace” program assist visitors as a guide to keeping Southern Humboldt and its natural environment intact. The redwood forest, the mighty Pacific Ocean, the Avenue of the Giants and the many towns along the way rely on a clean and safe environment. We are Dog Friendly! There is plenty of open space that visitors and dogs alike can enjoy. Dog friendly lodging is prevalent as well in Southern Humboldt. Dog etiquette is important for you and your pet. When enjoying wild places with your dog, please: Be familiar with site specific regulations. Control your dog. Generally it is best to keep your dog on a leash when exploring wild places. Dogs are not allowed to approach people in a threatening manner or in any way harass people, horses or other dogs. Keep your dog with you. Be courteous to others. Pick up after your dog. Town sidewalks and streets are known as the commons, the public spaces to be used respectfully. Locals and visitors alike are asked to use common sense and to be considerate and respectful of others in both public and private spaces. Each citizen (local or traveler), is responsible for his/her (and pet’s) impact on the environment of the commons. Individuals should keep gear together and clean up any trash made (cigarette butts, etc.). Dogs must be licensed according to California Health Code 121690(a). See the Community Services Listings beginning on page 10 for dog licensing information and the Garberville Redway Veterinary Group.